England restricted team India for 107 runs in the first innings of the second test match at Lord's cricket stadium of London. After winning the toss, English skipper Joe Root opted to bowl and invited team India to bat first. English pacer James Anderson picked up 5 wickets, while Chris Woakes dismissed 2, Stuart Broad and Sam Curran clinched 1 wickets each. 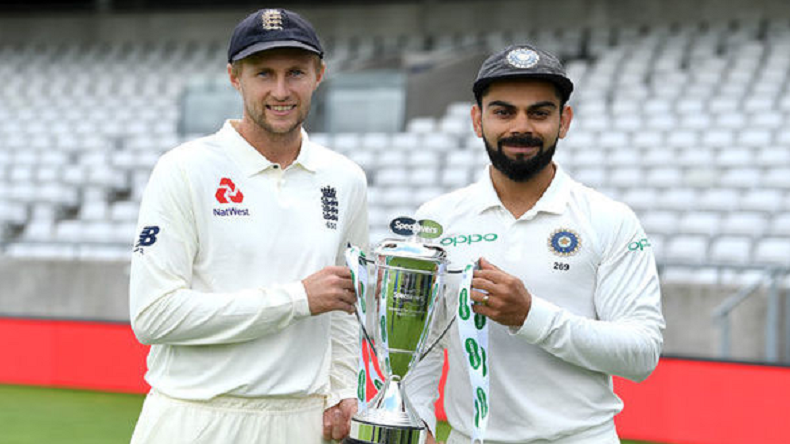 The second test of the five-match series between India and England kicked off on Friday at Lord’s cricket stadium in London. The match was scheduled to start from Thursday but due to rain the first day of the match was washed out. The second day of the match was like a nightmare for Virat Kohli and company as English bowlers restricted team India for only 107 runs. English pacer James Anderson was the hero for the hosts as he dismissed 5 Indian batsmen for only 20 runs in 13.2 overs out of which 5 were maiden. Performing equally well Chris Woakes picked 2, Stuart Broad and Sam Curran clinched 1 wickets each. Worlds no 1 test team’s batting line collapsed like a house of cards at Lord’s and visitors were totally clueless on the green and bouncy track in front swinging deliveries. Earlier today, after winning the toss, English skipper Joe Root opted to bowl and invited India to bat first. For the Lord’s test, skipper Virat Kohli made 2 big changes as test specialist batsman Cheteshwar Pujara and left-arm spinner Kuldeep Yadav have been recalled to the team in place of Shikhar Dhawan and Umesh Yadav. Shikhar Dhawan’s form was in talks as he is out of form from a long time. While the second big change that may help India is adding Kuldeep Yadav, who had performed outstandingly well and troubled English batsmen allot in the one day and T20I series. Unfortunately the rain has stopped play with India 11/2 after 6.3 overs.